이 백자 청화보상당초문 항아리는 구연부가 직립하며 좁아지고 어깨가 넓고 저부가 좁아지다가 넓어져 접지면에 이르는 기형이 조선 전기의 특징을 보여준다. 몸통 전면에 활기차게 그려진 보상당초문 역시 조선전기 청화백자 도안의 특징을 보여주고 있는데, 청화발색은 고르지 않다. 백토는 순결한 백색으로 유층은 빙렬이 없는 담청을 띠는 투명유이다. 당당한 호의 형태와 적절히 포치된 보상당초문의 표현 등이 조선전기 청화백자 연구에 또 다른 학술적 연구의 일면을 제공하기에 충분한 작품이다. This white porcelain jar is decorated with a floral medallion and scroll design in underglaze cobalt blue. 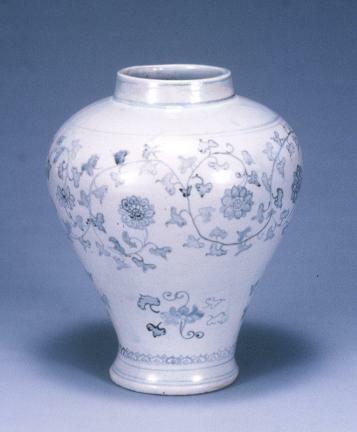 It exhibits the typical characteristics of white porcelain wares in underglaze cobalt blue of the early Joseon Dynasty, including a mouth that narrows toward the top and the pronounced S-shaped curve of the body, which tapers as it flows from the broad shoulder toward the lower part of the body and then flares slightly at the base. The floral medallion and scroll designs painted on the body in vibrant brushstrokes are also decorative patterns commonly found on blue-and-white porcelain wares of that period. However, the cobalt blue color has not come out evenly. The clay is of a pure white color, and the clear, transparent glaze is of a pale blue tone, with no visible crackles. This blue-and-white porcelain jar is a work of considerable artistry whose exquisitely rendered floral medallion and scroll designs and dignified formal beauty make it a valuable piece for the study of blue-and-white porcelain wares of the early Joseon Dynasty.